All of You is a romantic film starring Derek Ramsay and Jennylyn Mercado and one of the eight official entries to the 2017 Metro Manila Film Festival. Directed by Dan Villegas under Quantum Film and MJM Productions, released last December 25, 2017. 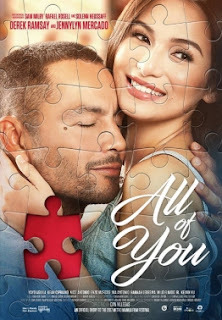 A romantic story of Gabby (Jennylyn Mercado), a woman who is all too willing to settle down, and Gab (Derek Ramsay), a man who doesn’t share the same thoughts on commitment. The two had their first date turning into a serious relationship. Just in no time the two are living together and about to discover the intriguing aspects in a relationship and will try to understand it. Another film that will touch your heart and open your mind in terms of being in a relationship. A story that unlocks the curious minds of viewers, revealing that being in love you will not is not experience only the good moments but rather have the bad side as well. A modern and realistic movie that I recommend for moviegoers out there.